President Muhammadu Buhari on Wednesday morning met with Senate President Bukola Saraki and Speaker of the House of Representatives, Yakubu Dogara, over the killings in Plateau State. Mr Buhari's aide on New Media, Tolu Ogunlesi, who tweeted about the meeting, said it was held before the president went into the weekly meeting of the Federal Executive Council (FEC). "SP @bukolasaraki and Speaker @YakubDogara met with the President this morning, before FEC, regarding the killings in Plateau State. Agenda was how NASS and Executive can collaborate better to improve security and humanitarian relief. #AsoVillaToday," Mr Ogunlesi said. Violence between herdsmen and locals in Plateau State has led to the death of about 100 persons in the past week with majority of them killed on Saturday by suspected herdsmen. While Vice President Yemi Osinbajo visited the troubled state on Monday, Mr Buhari visited on Tuesday. The Inspector General of Police, Ibrahim Idris, and the Minister of Interior, Abdulrahman Dambazzau, were also in Plateau State on Tuesday. Mr Osinbajo had announced that more military personnel will be mobilised to the state to restore peace. 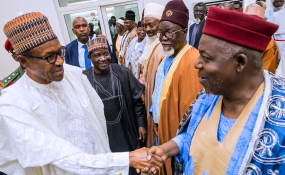 On his part, President Buhari, who called for calm, also reiterated the commitment of the federal government to bring an end to the killings in the state.